Low back pain is a common medical complaint and, in the United States alone, more than 5 million people are disabled by low back pain, half of these permanently. Low back pain affects most people at some point during their lifetimes. It is the second most frequently reported illness in industrialized countries, next to the common cold. In fact, it has been reported that 80 percent of the general U.S. population will at some time suffer from low back pain, and 20 percent are suffering at any one time. Ninety percent of low back pain is mechanical. This type of low back pain is the result of overuse or straining, spraining, lifting, or bending that results in ligament sprains, muscle pulls, or disc herniations. While disc problems have gotten much of the credit for low back pain, ligament injury is a more important source of back pain. In fact, it has been reported that only 4 percent of low back pain is due to a herniated disc. It is known that weakening of the spinal ligaments precedes disc herniations. For a disc to herniate, there must first be a primary ligament weakness and a deteriorating disc. This also leads to decreased disc height. In addition, the ligament that holds the disc in place becomes lax and weakened. As a result, the joint becomes unstable and more likely to herniate. Piriformis syndrome is another often overlooked reason for sciatica, leg or buttock pain. The piriformis muscle tendon attaches directly over the exiting sciatic nerve (see Figure 3). Injury, straining, or micro-tears to the piriformis tendon or other surrounding ligamentous structures result in inflammation and swelling which results in pressure on the sciatic nerve, creating a “sciatica” syndrome. Sciatic nerve as it transverses under piriformis muscle. Injury to the piriformis muscle or surrounding sacroiliac structures can cause swelling and put pressure on the sciatic nerve, causing buttocks and leg pain. Ligaments hold the disc in place, so if the ligament weakens, the disc can move. Although initial onset of disc herniations is usually extremely painful and acute, in a few days to a few weeks, the protruding disc segment slowly shrivels away. In fact, with or without treatment, most disc herniations reabsorb and resolve within two to six weeks, with up to 90 percent back-to-normal activity within one month regardless of treatment. However 10 percent of individuals go on to have chronic low back pain that includes muscle pain, spasm, and stiffness (a sign of a ligament laxity and a weak joint), sometimes with pain going down the legs. These symptoms may persist long after the disc herniation itself has shriveled away because of weakened back ligaments (including the sacro-iliac ligaments) which has not healed. Sometimes these weak ligaments refer pain down the leg, immitating sciatica (see Figure 2). Prolotherapy can help stabilize and strengthen the ligaments around these weakened joints to reduce or eliminate pain. 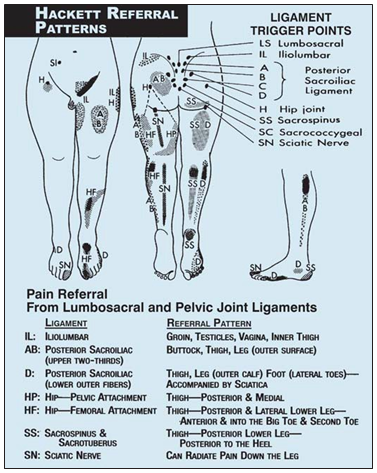 Pain referral patterns from lumbosacral and pelvic joint ligaments. From Hauser, “Prolo Your Pain Away,” Second Edition. 2004. Beulah Land Press. A study by Merriman, evaluating patients treated during his 40 years as a general and industrial surgeon, compared Prolotherapy with fusion for sciatic pain. His conclusion was that conservative treatment by Prolotherapy - after a confirmed diagnosis of ligamental and tendinous laxity - was successful in 80 to 90 percent of more than 15,000 patients treated with Prolotherapy and had fewer side effects than with spinal fusion. "Dr. Alderman is very thorough she explains everything... I came to her with a 20-30 year old lower back injury - I can now resume my activities because of Prolotherapy." "My life has been given back to me." "After 4 Prolotherapy injection treatments by the end of October the severe stabbing pain was gone!" "From the first treatment I noticed a stabilization occurring in my back." "My back is much stronger. Work that would normally leave me in pain no longer does." "After 1 treatment my condition improved dramatically..."
"With much research and fear I tried and noticed a gradual ability to walk without using the walls and started to attend my children’s activities again." "I broke my back in a snowboarding accident..."
"I can play with my son! That's the greatest reward." "Back/knee pain almost 100% gone. Golf swing is back." "I am pain free and my lower back feels stronger than it ever has." "I feel more stable in my back and it feels more connected than it has in a long time." "My life has been given back to me! I take walks and bike rides with my children now." "Recently completed a 3 week backpacking trek that I may not have been able to do earlier." "Of all the things I tried this was the best." "I can do everything I enjoy." "My back has hurt every day for the last thirty years. This is my second treatment of Prolotherapy... when traditional orthopedic treatment failed." "My back is totally pain free and hip is much improved." "The best part is that it is a permanent change. So, I guess Prolotherapy really works, no doubt!" "Prolotherapy dramatically improved lower back stability and decrease in pain." "The idea of the shots in your back seem to hurt more than the shots. After my first visit I couldn't believe how much I've improved."